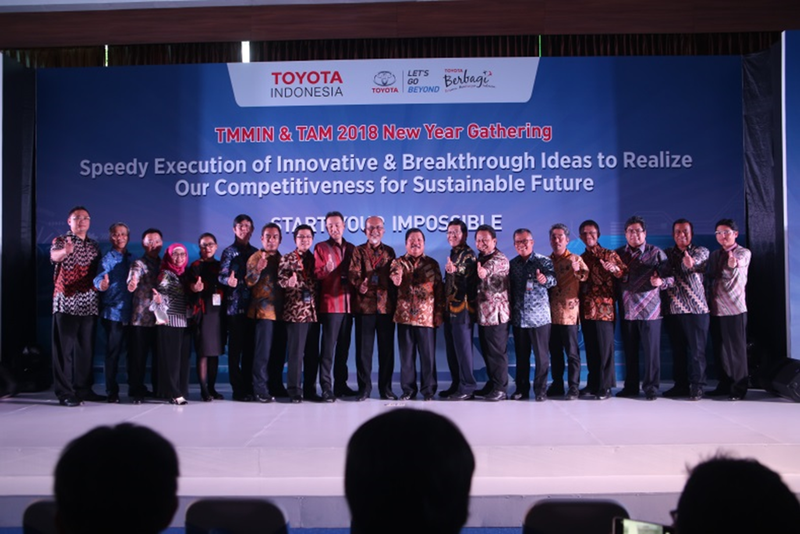 Toyota - In welcoming a new year with a new spirit then Toyota Indonesia set up a New Year Gathering 2018 on Wednesday, January 3, 2018 located at Alphard Hall Head Office. This kind of event are are running simultaneously both in Plant Sunter and Karawang, Cibitung as the flashback momentum of all activities in 2017 and listening to the guideline presentation by Top Management in 2018. This New Year Gathering's theme is "Speedy Execution of Innovation & Breakthrough Ideas to Realize Our Competitiveness for Sustainable Future" which illustrates the guideline of Top Management related to the spirit of change to improve the competitiveness of enterprises. On the New Year speech by President Director, Mr. Warih Andang Tjahjono delivered the need to accelerate the execution of breakthrough ideas to improve the competitiveness of the company. He also deliverd a message to always maintain high integrity in work, and also invites all members to gather strength to achieve high targets. He also mention a reminder to all members to always enjoy every process. Lets together we work hard along this 2018 for our future and Indonesia as well.